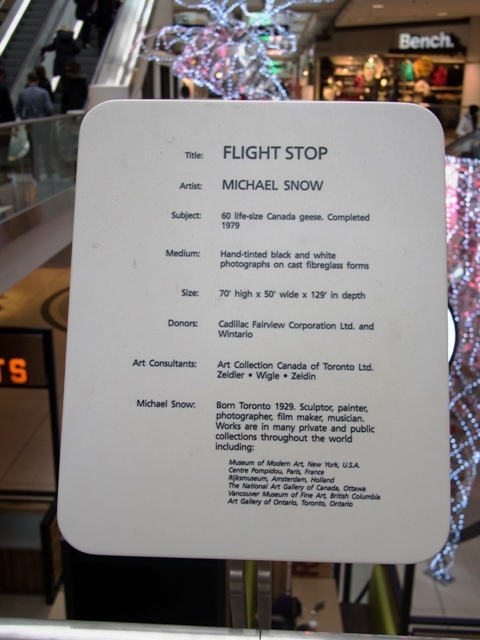 In 1979, Michael Snow, a Canadian artist of international repute, was commissioned to create a sculpture to be installed in the Eaton Centre, a large office building/shopping centre complex in downtown Toronto. 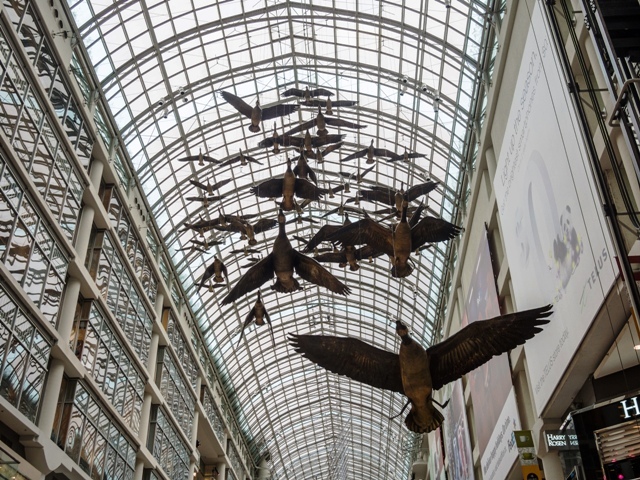 The sculpture comprised 60 separate elements, each representing Canadian geese in various sizes and flight positions. 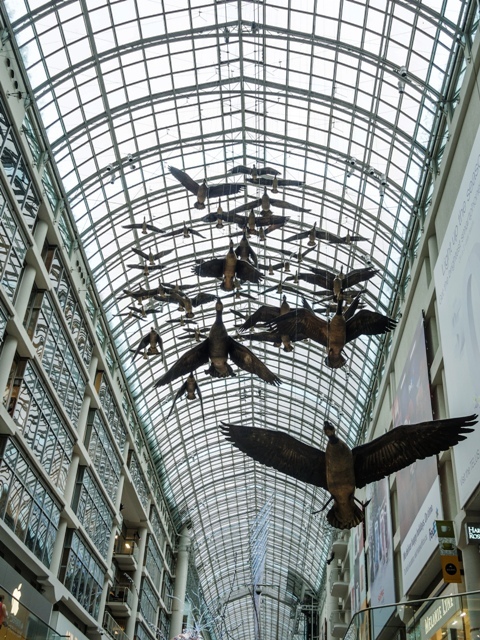 The sculpture, entitled “Flight Stop” and partly financed by monies from a provincial lottery, was purchased by the sublessor of the Eaton Centre. Under Snow’s supervision, the sculpture was hung from the ceiling of the inside galleria of the shopping complex. A plaque, announcing Snow as the artist of the work, was also installed. The sculpture soon became a focal point of the Centre, and was critically acclaimed as an important piece by critics. In mid-1982, the then-marketing director for the Eaton Centre commenced plans for the decoration of the complex in anticipation of the Christmas shopping season. The plan involved attaching large red ribbons to the necks of the 60 geese and using the beribboned goose symbol on posters, shopping bags and banners. Snow was not consulted in advance of this plan being put into execution. On seeing the way in which his work had been used, Snow thought these additions “jarred the harmony of his naturalistic composition, altered its basic character and purpose, and ultimately affected his artistic reputation”. Persistent complaints to the Eaton Centre’s management by Snow were unavailing. The Centre had already expended a large sum of money on the promotion, and believed that the ribbons did not detract from the work and that Snow was being unduly sensitive and inflexible. Moreover, the Managing Director’s affidavit made clear that she perceived herself as having the mandate “to exploit all or parts of Flight Stop to fulfill the commercial opportunities of the retail shopping of the Eaton Centre”. Further, “the Plaintiff was aware of the commercial usage that the work was to enjoy”. Independently of the author’s copyright, and even after assignment, either wholly or partially, of the said copyright, the author has the right to claim authorship of the work, as well as the right to restrain any distortion, mutilation or other modification of the work that would be prejudicial to his honour or reputation. Both parties were in agreement that, for the purposes of s. 12 (7), the sculpture qualified as a “work” and that Snow was its “author”. Further, it was also admitted that the plaintiff had not entered into any agreement that might allow for modifications to his work without his consent. “...[was] adamant in his belief that his naturalistic composition has been made to look ridiculous by the addition of ribbons and suggests [that] it is not unlike dangling earrings from the Venus de Milo”. Moreover, Snow’s affidavit was supported by three independent art experts. All three testified to the importance of “Flight Stop” as a work of art, and considered its decoration as making a mockery of its intended purpose by distorting its appearance, transforming it into a “kitschy” sentimental display, resembling a Christmas bauble. They all considered that Snow’s artistic honour and reputation were prejudiced by the decorations. The defendants, unsurprisingly, contested Snow’s claim that, in terms of s. 12 (7), the addition of ribbons was in fact a “distortion, mutilation or modification” or that in any event it was "prejudicial to his honour or reputation". This was supported by a further affidavit from a well-known practising artist who thought the ribbons inoffensive and the whole a “joyful Christmas statement”, and that his favourable opinion of Snow was not in any way affected on seeing the work. At the conclusion of argument in Weekly Court on December 3rd, 1982, O’Brien J. found for the plaintiff and ordered the ribbons to be removed from the work by 9 a.m. the following Monday, December 6th. His Lordship’s reasons were brief. He found that the decorations did “distort or modify” the work, although he omitted to say that they “mutilated” it. As to the question of whether the distortion or modification would be “prejudicial to [Snow’s] honour or reputation”, O’Brien J. made clear his view that those words involved “a certain subjective element or judgment on the part of the author so long as it is reasonably arrived at”. Snow clearly believed that his honour or reputation had been affected by the defendants' acts. This view, being “shared by a number of other well-respected artists and people knowledgeable in his field”, was “reasonable under the circumstances”. Accordingly, O’Brien J. was prepared to give considerable weight to the artist’s views on this question, so long as they were “reasonably arrived at”. In other words, a breach of s 12 (7) could be satisfied by the artist’s own perception, supported by some credible testimony from members of the public or the art community. Images supplied by Chris Liaw.